Borderlinx | Buy One Stop Plus and ship worldwide with Borderlinx. Cheap rates guaranteed. Finding amazing fashion, no matter who you are or what size you wear, shouldn't have to be a struggle. But now with One Stop Plus USA, it's easy to find perfect fits and exciting plus size styles for women and men! One Stop Plus USA brings together the world's greatest pieces in plus size fashion to one fabulous online location. With affordable apparel, accessories, and home items available accompanied by tens of thousands of customer reviews, it's easy to see why One Stop Plus USA fashion is rapidly becoming a global favorite in online retail. One Stop Plus USA sets itself apart in the world of fashion through its promise to help you find just your right style, fit, and unique expression. With up to 70 sizing options available, One Stop Plus USA products are available from recognized brands across the globe. Shop your favorite brands, and explore exciting new ones! One Stop Plus USA also offers a wide selection of home and beauty items such as bedding, bath accessories, jewelry and cosmetics, kitchen appliances, and more. One Stop Plus USA is committed to helping you find your perfect look affordably, and many amazing items are available for under $50. 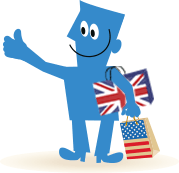 With Borderlinx, customers internationally can now buy One Stop Plus USA! Using our Shipping cost calculator to determine cheap shipping, tax & duties upfront, Borderlinx will ship your order to your home country. A number of additional services such as concierge, free repacking and consolidation are available through Borderlinx to make international ordering from One Stop Plus USA hassle-free.